Peyton List stars in Frequency, new this season on The CW. This television season, joining a crowded time-travel-themed field already occupied by Doctor Who, Legends of Tomorrow, 12 Monkeys and The Flash (which is owning its time travel elements even more deeply in its current third season), are ABC’s adaptation of the 1979 film Time after Time and Fox’s Adam Pally-helmed sci-fi/comedy Making History, NBC’s Timeless and The CW’s Frequency. We’ll have to wait until early in 2017 for the first two, but last week the first episodes of Timeless and Frequency premiered. With only one episode apiece having aired, both are entertaining additions to the genre, but Frequency is off to the much more promising start. 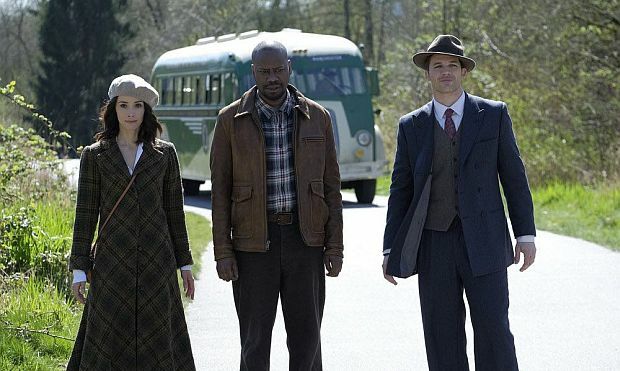 Abigail Spencer, Malcolm Barrett and Matt Lanter in NBC's Timeless. Premiering on NBC last Monday, Timeless stars Abigail Spencer (Rectify) as history professor Lucy Preston who, along with Delta Force soldier Wyatt Logan (Matt Lanter) and computer engineer Rufus Carlin (Malcolm Barrett, Better Off Ted) are drafted by U.S. Homeland Security to chase a stolen time machine into the past to stave off the damage the thieves might do to American history. The criminal mastermind they are chasing is Garcia Flynn (played by ER’s Goran Višnjić), though we already have clues that Flynn’s plans might be far more complex than merely widespread terrorist destruction. For all the gunplay and fiery explosions (we get to see two rather gorgeous exploding Hindenburgs in the first hour alone), Timeless borrows from the kind of light sci-fi fare that the SyFy network used to be known for, from Eureka to Warehouse 13. (A clue to this implied playfulness can be observed in the name of Barrett’s character, a not-so-subtle reference to the character famously inhabited by George Carlin in Bill & Ted’s Excellent Adventure.) Though appealing drawn, the first hour gives us precious little on our three main characters, save for establishing the broad personality tensions among the three and the roles each is clearly intended to play on their ongoing missions: Lucy is there to know stuff, Wyatt is there to punch and shoot stuff, and Rufus is there to help MacGyver them out of sticky spots with only “stone knives and bearskins.” Though it seems Timeless viewers should gear up for episodic time-jump-of-the-week plots – the first season is reported to include visits to Abe Lincoln and Davy Crockett – the pilot also gives us the first glimpse into a wider arc/conspiracy storyline that will no doubt be delivered in small doses along the way. Truth be told, however, those elements of thematic seriousness is where the first hour stumbles. Timeless will have to step more firmly in one direction or the other for it to justify its existence among this suddenly expanded time-travel universe, either by more fully owning the goofiness of the show’s premise or by taking the world it has created much more seriously. Timeless comes with some built-in charm and it could, nonetheless, prove to be a light distraction this season, but if you are looking for a more adult and deeply human time-travel story, you likely won’t find it here. For that (and I hardly believe I’m writing this sentence), you’ll have to switch over to The CW. 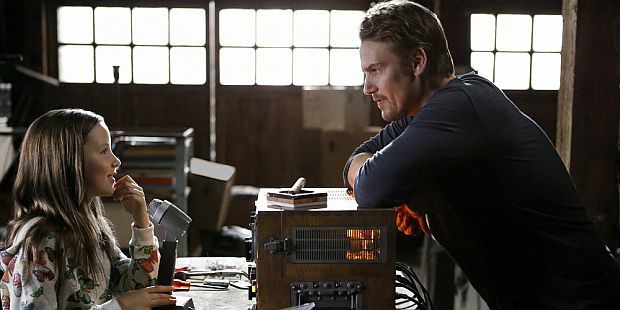 Ada Becker (as the young Raimy Sullivan) and Riley Smith in Frequency. Based on the 2000 film of the same name, Frequency is police procedural with a sci-fi twist. It stars Peyton List (The Tomorrow People, Mad Men) as NYPD Detective Raimy Sullivan. Twenty years earlier, her father Frank Sullivan – also an NYPD detective, played by Riley Smith – was gunned down in an undercover operation, leaving his reputation and the lives of his wife and then-8-year-old daughter in ruins. On the eve of her 28th birthday, Raimy stumbles across her father’s old ham radio and discovers that it is somehow linked to her father’s own version of the device precisely twenty years in the past – coincidentally on the eve of his death. A timely warning gives Frank just enough to survive the assault, but the impact of this change has darker consequences for the timeline in the present. Now, across time, father and daughter work a case from both ends – Frank in 1996 and Raimy in 2016 – in order to stop a serial killer and to uncover the conspiracy and betrayals that led to his original murder. Like the film it is based on, Frequency is more crime story and family drama than science fiction/fantasy. The original movie, starring Dennis Quaid and Jim Caviezel, is a gem and has long been a favourite of mine. The power of the movie, even more than 15 years later, lies in its screenplay, penned by Toby Emmerich, and its restrained direction by Gregory Hoblit. (Emmerich is mainly known for his role as producer, from Elf to The Hobbit: An Unexpected Journey, though the script for Frequency predates his life as a Hollywood executive and marks one of only two onscreen writing credits.) It’s a story about people, not physics, and for all its police thriller and science fiction elements, it is a love letter to father-son relationships, America, and, well, baseball. If you haven’t seen it, think Field of Dreams meets Frantic. 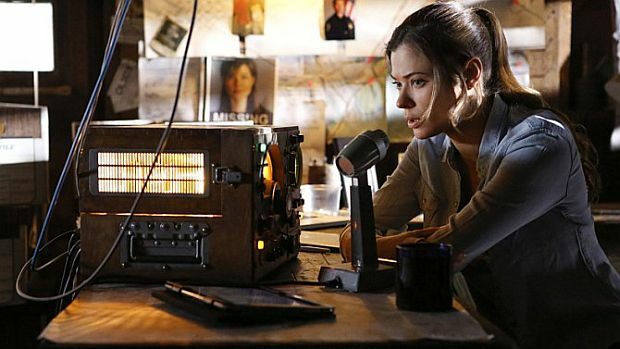 Time will reveal whether Frequency's police procedural elements will be able to hold their own to the human core of the story. Still, the developing relationship between Frank and the adult Raimy will have to be its beating heart – a particular challenge in a story structured so that the two main leads can never meet in the same room or interact except by voice, over a radio. Both film and pilot do that refreshing well: portraying normal, non-scientific people who haven't ever considered the intricacies of temporal causality, getting caught up in the sheer joy of reconnecting with a lost loved one – with no thought to butterfly effects or grandfather paradoxes or tachyons. Something beautiful and rich and unique comes along with the story’s unusual conceit, as Frank raises his sweet and shining eight-year-old daughter (full of possibilities, innocence, and dreams) and is simultaneously getting to know her as a grown woman, with strengths and flaws and some long fermented anger. Here the series could move quickly beyond the emotive force of the film and find a powerful voice all of its own. The second episode of Timeless airs tomorrow on NBC. Frequency’s second episode airs Wednesday on The CW.